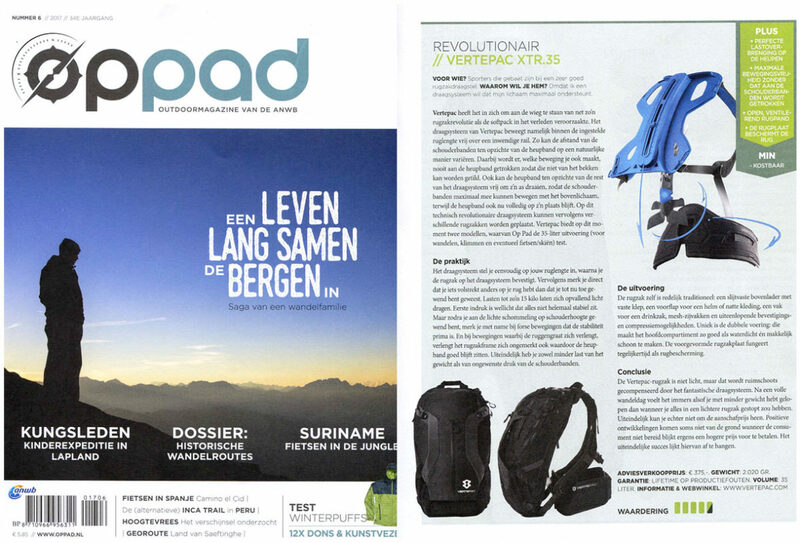 Today a great test review was published in outdoor magazine ‘Op Pad’ #6 2017 (ANWB) where the Vertepac was granted 41/2 stars! Athletes who would like to benefit from a very good backpack. Because you want a carrying system that supports your body fully. Vertepac has the potential to be at the cradle of just such a backpack revolution as the ‘soft pack’ has caused in the past. The Vertepac carrying system moves freely over an internal rail within the set spine length. For example, the distance between the shoulder straps and the hip belt can vary in a natural way. In addition, whatever movement you make, the hip belt never gets pulled upward and thus will not be lifted from your pelvis. The hip belt can also rotate freely around its axes with respect to the rest of the carrying system, so that the shoulder straps can move maximally with your upper body, while the hip belt remains fully in place. Various backpack units can then be placed on this technically revolutionary carrying system. Vertepac currently offers two models, of which Op Pad (Dutch outdoor magazine) has tested the 35-liter version (for walking, climbing and possibly cycling / skiing). The carrying system is easily adjusted to your back length, after which you attach the backpack (unit) to the carrying system. Then you immediately notice you are carrying something completely different on your back than you’ve been used to. Even loads of up to 15 kilos (33 lbs) are carried surprisingly light. First impression is perhaps that it does not feel completely stable, but as soon as you are used to the slight fluctuation at shoulder height, you notice especially with strong movements that the required stability is there. And with body movements where your own spine extends, the backpack frame also extends unnoticed, so that the hip belt stays in place. Ultimately, you are bothered less by the weight of the load as well as unwanted pressure from the shoulder straps (upon your shoulders and spine). The backpack itself is fairly traditional: a wear-resistant top loader with fixed flap, a front flap for a helmet or wet clothing, a compartment for a drinking bag, mesh side pockets and various fastening and compression options. Unique is the double lining: it makes the main compartment as good as waterproof and easy to clean. The preformed backpack plate functions simultaneously as a back protector. The Vertepac backpack is not light, but that is largely compensated by the fantastic carrying system. After a full day of hiking it feels like you have walked with less weight than if you would have put everything in a lighter backpack. In the end, however, you can not ignore the purchase price. Positive developments sometimes do not get off the ground when the consumer is not willing to pay a higher price for it. The ultimate success seems to depend on this. Recommended retail price: € 375, -. Weight complete system: 2.020 gr.